Saturday morning, I usually have a full house! Last night, dh, I and our youngest watched “UP” all together in our bed. This morning, as I always do, I peek into my kids’ room. I expect all four sleeping peacefully in their bedroom – but then ..
Two and Three are not in their bedroom! 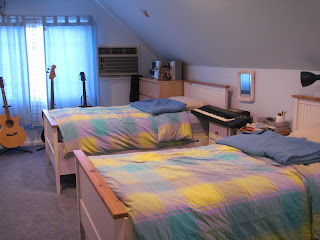 Yes, the bedroom is perfectly neat and tidy – but it’s missing my two boys! I guess I have to blow kisses “good morning” in the air so that they reach PA and CA. I guess, they’re both right – One day, I’ll miss the mess they make in their room! You don’t have to be side by side to be together. The kids are right and wrong - you will miss them, but not their mess! Jonathon will miss the messy room and his brother. I agree UP is a must see. It really is a movie that the whole family would enjoy. Although the beginning was a little sad. Anyway, I agree you will miss the boys but not the mess.